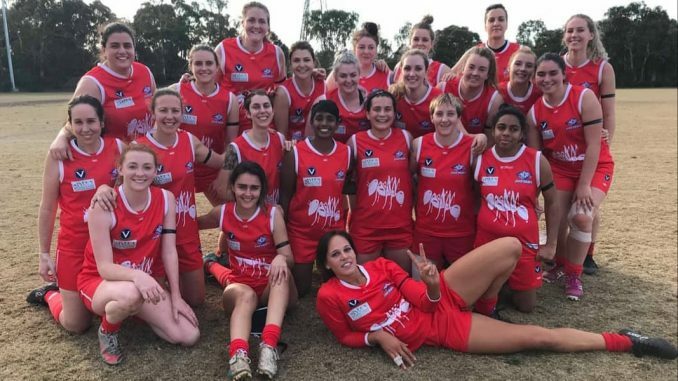 She had never played competitive footy before this season – but AFL Women’s League aspirant Jacara Thomas is a fierce competitor on the rise. Thomas, 30, won the inaugural Best & Fairest for the Preston Football Club women’s team for the 2018 season at the club presentation on September 22. Winning the count with 106 votes, Thomas took home the clubs first best-and-fairest award for a woman player ahead – a mile ahead of fellow midfielders Anita Ovenden (64 votes) and Georgia Freer (62). Thomas also won the team’s Best Finals Player award. What made the win so rewarding was not only that it was her debut season in competitive football, but that she managed it while also starting up her first businessman partnership with with husband Shaun. She also works part time as a personal trainer, a mental health social worker – all the while being a mum to her two young boys, Taten and Archie. Of Indigenous heritage, Thomas was born in Melbourne, then made her way through Mildura and Darwin before returning to the big smoke. Her father Phil Egan played for Richmond during the 1980s, so Aussie Rules is embedded in her DNA. “I reflect back on when I first came to Melbourne and I kind of think, wow, I was totally freaking out and anxious,” she said. Growing up as an outsider from the country is never easy, but when you’re a young Aboriginal woman things can become harder still. “I was protected from a lot of it by family,” Thomas told Hatch. It would continue later in life as well, with verbal barbs such as, ‘How much Aboriginal are you?’, and ‘You don’t look Aboriginal, you’re too pretty to be Aboriginal’ fired her way. It was a challenging time, but being independent and strong held her in good stead. The friendships she forged in those early years were always built on an acceptance of her personality, abilities and culture. With an academic mindset, the support she received in getting an education was absolute from both her parents. Working as a personal trainer and social worker gives Jacara a valuable chance to contribute to the broader Indigenous community on a day-to-day basis with her new business Storm Health & Fitness. “As Indigenous women we carry a cultural load and responsibility to care for and carry our community into the future,” she says. With two young boys looking up to her, Jacara explains how she felt about them watching their mum play. And what about when they are old enough to understand? So what’s next for the all conquering midfielder, mother and business entrepreneur? “Work hard to get looked at seriously to play at VFL level, AFL would be a dream, but having that connection with dad has been special to me,” she says. Shaun and Jacara Thomas with Indigenous Olympic athlete Kyle Vander Kuyp. And her work in the Indigenous community and hope for race relations? “I hope we make rapid progress, more than what we have had in the last 15 years. The fact we are still having a debate over whether or not Aboriginal culture and history should be taught in schools is a disgrace.